If you're one for architectural brilliance and great hospitality - visit the Rajbaris in Bengal. Kolkata is home to some of the most gorgeous royal houses (locally called rajbaris) that have been converted into heritage hotels, offering a rich taste of the culture of West Bengal. If you’re looking for a weekend getaway option, staying at one of these heritage boutique hotels is highly recommended. The rajbaris stand the test of time giving the modern folks a chance to experience the grandeur of old Bengal and you shouldn’t miss that for anything. Located in the outskirts of Kolkata, Rajbari Bawali dates back to the 1700s. If you want to indulge in the feeling of the royal, opulent life, choose to stay in one of the four options – Classic Room with high ceilings, bookshelf and a poster bed; spacious Zamindari Suite; Royal Suite with separate living room or your very own Dak Bungalow for complete privacy. You can also enjoy activities like a relaxing spa, swimming, a bicycle ride in the green countryside or a walk in the tiny villages surrounding the area. This one’s a well-preserved rajbari located two-and-a-half hours from Kolkata. There are guided tours here and daily evening aartis are held for those looking to immerse themselves in the cultural grandeur of this heritage property. 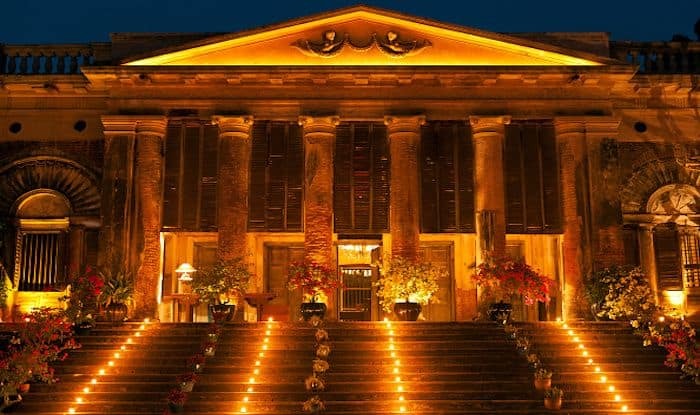 A part of this mansion has been turned into a heritage hotel – with some really interesting names for the rooms such as: Boro Boudi, Choto Boudi, Thakuma, Boro Pishi, Kaka Babu and Jatha Mashai. You can also opt from among the cozy mud huts with modern facilities – Aparajita, Madhabilata, Kanaklata and Jhumkolata. The food here is prepared by the cook who has been in the service of the royal family for generations. The dishes are authentically Bengali and are served in the utensils belonging to the family heirloom. Jhargram Palace has an interesting historical background that reflects how Bengal is truly a melting pot of all cultures. This grand mansion was built by the Malla Dev Royal family in an ethnic and Italian architectural style. The palace is surrounded by sprawling lawn and picturesque gardens, giving you the feeling of utmost luxury in rural Bengal. The ground floor of the palace is open for hospitality whereas the rest of it is still occupied by the royal family.